Zinc is an essential element required by all living things. Every organ and tissue in the body contains and requires zinc. It plays roles in development, tissue growth, and in all major bodily functions. Several thousand kinds of proteins in the body contain zinc. Zinc also affects the way cells signal each other — it has been found to influence hormone release and the transmission of information along nerves. improving a variety of brain functions. Orotates have special properties in their own right, especially with respect to fighting cardiovascular disease. 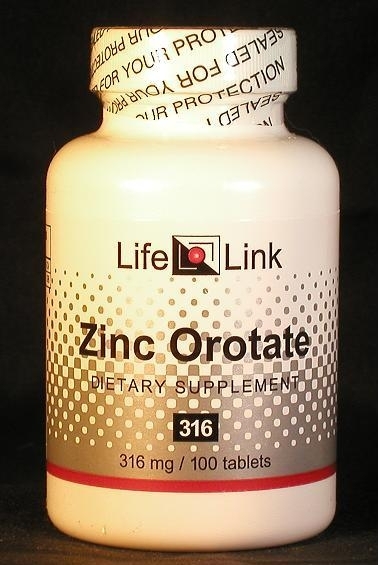 Accordingly, we will limit our discussion of zinc orotate to a brief summary of relevant research, and let you draw your own conclusions about what medical conditions it may be effective in treating. Organic zinc salts, such as zinc orotate, were shown in experiments with mice to protect the liver from the lethality of a large dose of ethyl alcohol. The protective effect is thought to involve the neutralization of free radicals in the liver tissues injured by alcohol.12 Alcohol lovers might therefore benefit from regular supplementation with zinc orotate. Zinc deficiency is constantly observed in chronic inflammation due to disease, injury or aging.24 Yet zinc is an anti-inflammatory agent.25 Here we have a vicious circle: chronic inflammation depletes zinc; a shortage of zinc allows the inflammation to increase. The logical way out of this vicious circle would be zinc supplementation. Although the mechanism is unclear, it is known that zinc deficiency plays a role in causing osteoporosis.27 Zinc replacement by dietary zinc supplementation would therefore make sense as a prevention or treatment for osteoporosis. Are zinc orotate supplements useful for the conditions and purposes mentioned above? We aren’t allowed to tell you, so you should take a look at some of the references cited here, and then decide for yourself.